The Rama Principle is the Principle of Love that descended from Heaven as the Gift of the Gods, as a result of the Great Sacrifice. Rama means Delight! Nothing delights more than one’s own innate self, and so, Rama is also known as Atma Rama. How then could Bharatha agree to usurp the throne, of which Rama is the rightful heir? 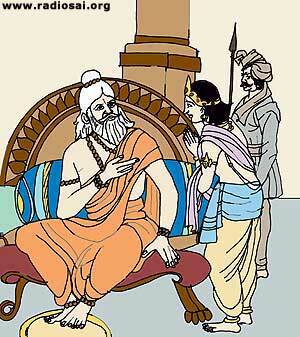 He and Satrughna were at the Kekaya capital, when Rama was exiled and Dasaratha died, heartbroken at the separation. News was sent to him, and when he entered the palace, unaware of the double tragedy that had cast its gloom over the City, he sensed some calamity. Vasishta, the family preceptor, advised him to ascend the throne, for the empire was suffering an interregnum! Bharatha appealed that he be allowed to go to “the God of my prayers, the Lord who receives the homage of my unceasing adoration.” Vasishta told him that it was his father’s command, and his preceptor’s counsel that he sit enthroned as ruler. Bharatha replied that the request was proof of the extreme hatred that the parents, the people, the preceptor and everyone in Ayodhya had towards him, for had they loved him, they would not have pressed him to commit such a mean sin. Bharatha stood before Vasishta with folded palms. He prayed, “Is it just, is it fair, that you should burden me with the sovereignty over a kingdom, which slew my father, widowed my mothers, exiled my dearest brother, whom I value more than my very breath, to the demon-ridden jungle, with his dearly beloved queen and which finally brought indelible disgrace on my mother? My empire is the realm which Rama rules over, namely, my heart, which is too small to contain His glory.” Bharatha’s name itself signifies that he is saturated with love of Rama. (Bha—means, Bhagavan—the Lord, Rama; ratha—means, pleased by, happy over, attached to). Let the Love for the Lord grow in you, as it did in Bharatha. Let that sense of adoration, which discarded even a throne, flourish in you. Then, you can be of great use to your country, your culture, your society, your religion and your community. Or else, all this bother that you have undergone, to attend Sathsanga (good company), to listen to spiritual discourses, study spiritual texts, etc. will be a colossal exercise in futility.